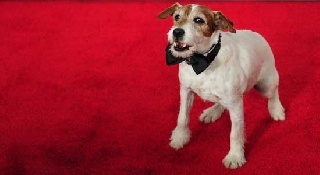 Uggie, the famous Jack Russell Terrier and one of the stars of the Oscar award-winning movie, The Artist, has a new book that will be released on October 16, 2012. Uggie — My Story, tells the story of the rags to riches pooch who was rescued from a dog pound by Omar Von Muller, an animal trainer. Throughout his career, Uggie has toured with a dog talent show, starred in commercials, and has been in several movies, include the 2011 hit, Water for Elephants, and the 2011 Oscar winner, The Artist. He lives in north Hollywood with Von Muller and his family. Uggie “retired” after his February 2012 Oscar appearance but the mighty pooch has now penned a book that takes a look back at his life and career. The book is a collaborative effort between Wendy Holden and Von Muller. Uggie is the first dog in film industry history to leave his paws behind at the Hollywood trademark of Grauman’s Chinese Theatre. The dog is both scene and heart stealer, having garnered the Palm Dog Award at the 2011 Cannes Film Festival. He was also awarded with a Golden Collar Award earlier this year. For more about Uggie’s book, visit http://www.amazon.com/Uggie-My-Story-Uggie/dp/1476700168.